If you're thinking about producing apparel or sewn products this session is for you! Lear how to accelerate profits and improve customer satisfaction at this workshop presented by Manex. Speakeasy is celebrating sixteen years of brewing great beer in San Francisco, and they're doing it big. Join us for unlimited pours of Speakeasy beer, food trucks, live bands, awesome vendors— and a portion of the proceeds benefit SFMade! Announcing the new Manufacturer's Accelerator Program! The program offers a select cohort of growth stage companies the opportunity to develop to the next level by collaborating and learning from each other, as well as receiving specialized assistance from industry experts. SFMade members with 5+ employees that have been in business for over two years should apply by emailing [email protected]. SFMade members complete an annual survey. We collect and summarize the data. That data goes into the Annual State of Local Manufacturing Report, which is the only report of its kind on San Francisco's manufacturing sector. It informs local policy desicions, helps us to improve our programs, and describes the sector's powerful economic impact on the city. So SFMade members, look out for a survey coming soon to your inbox. Everyone else, look out for a date in late October when we'll host the Annual State of Local Manufacturing Breakfast, where we release the report and discuss our mission to help manufacturers start, grow and stay in San Francisco! More details and an invitation coming soon. Product We Love: If you see a pushcart and smell coffee, don't hesitate to follow it! Nomadic Ground is a new organic and fair trade pop-up coffee roaster. Each bag of the signature Nomadic Ground Blend comes with a poem inside. Owner Thomas Landry provides beans to local cafes, and has a podcast via his pushcart, which unfolds to a table where coffee is served and conversations are recorded. The new Cut Loose factory is big, airy and smells faintly like sawdust. From just a few feet into the doorway you can overlook the factory floor, where fabrics in all colors are being dyed, folded and stacked. Patternmakers work in rooms with light filtering in, and designers decorate freshly painted walls with magazine clips. The company that got its start street vending t-shirts has just bought its very own building; it's in the Bayview, with 50 employees, and houses a product that just keeps selling. 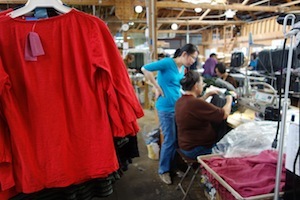 Cut Loose began hawking hand-dyed, one-size-fits-all clothing on Fisherman's Wharf in the 1970's. Back then, t-shirts in great colors were a rarity, and so was dying them in a clawfoot tub. They've since evolved to using customized machines and non-toxic dyes. The company develops many of their own fabrics and works with mills in the U.S. Their clothes, now sold at over 500 stores, have kept the same style: relaxed and fluid with strong, distinctive colors. 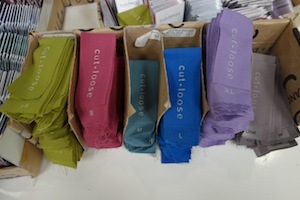 Cut Loose does all the product development in-house, and outsources its sewing production to San Francisco factories. While the company has been making products in San Francisco since the beginning, it's only since their SFMade membership that they really started advertising it. In the window of the company's San Francisco store on Valencia Street is a big SFMade decal. "We really appreciate the marketing SFMade does," said owner Rosemarie Ovian. "It's been helpful with our store, and we just appreciate that you guys are here."